This show had an identity crisis. 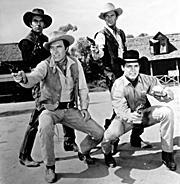 In the first season Marshal Caine and Deputies Martin and Foreman were the stars. Now this took place in Stillwater, Oklahoma in the 1890’s when the Dalton and Jennings Gangs presented some tough desperados for the law. The novel approach of the show was that each episode was seen thru the eyes of the bad guys. Well, I thought it was an interesting concept but the producers evidently didn’t. By the second season both Caine and Martin are gone and Foreman is now a Marshal with his own deputy. Promoted, I assume. And the stories are told from the perspective of the good guys. Barton MacLane died in 1969 of cancer. Bruce Yarnell died in 1973 in a plane crash. Slim Pickens in 1983 of a brain tumor. Jock Gaynor died in 1998. A fictionalized telling of the story of Sheriff Pat Garrett and Billy the Kid (William H. Bonney). It’s New Mexico in the 1870s and Garrett and the Kid have an almost paternal relationship. Yet each knows that they are on opposite sides of the law and must one day collide.Although they never showed it, eventually Garrett kills Billy. Garrett is called the Tall Man because of his honesty and integrity. Barry Sullivan died in 1994 of a respiratory ailment. Tate has lost use of his left arm during the Civil War. 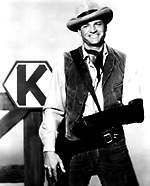 Which made it hard to find work so he traveled as a kinda wandering gunfighter. Looked mean too, with that arm wrapped in black leather! David MacLean died in 1995 of lung cancer. Hour long Western with Bendix playing the Superintendent of the Overland Stage Company, and Flippen as his sidekick. 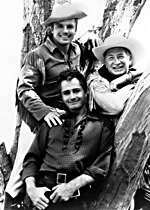 They were responsible for moving the stage line from Missouri, across the Rockies and on to California. Bendix was a crusty old soul, while Flip, who was raised by Indians, had a more adventurous nature. William Bendix died in 1964 of pneumonia. 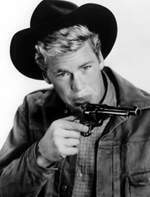 Doug McClure died in 1995 of lung cancer. This is another show about the stagecoaches which ran from Missouri to California, before the railroad made them obsolete. Luke and Simon were drivers and Simon’ s son David rode along. The stories focused on the people they met. 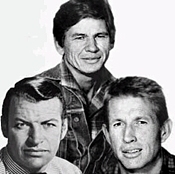 Wayne Rogers would be best known for his role as Trapper John on MASH. In Skagway, Alaska during the gold rush of 1897-1899, Mike Halliday had his hands full trying to keep Jeff Durain, a gambler and owner of the hotel/casino, on the up and up. There was an honest hotel. which was run by Kathy O’Hara who often helped Mike keep track of Durain. But it wasn’t true love, as Mike had many ladies, including Durain’s own girlfriend Goldie. Mari Blanchard died in 1970 of cancer, as did Joi Lansing in 1972. In the decade after the Civil War, Cord was a fast gun who worked undercover for Capt. Wingate, the commander fo Fort Scott, New Mexico. Sort of a Sonny Crockett on horseback! Pico and Billy were his friends and Ambrey ran the store at the fort. 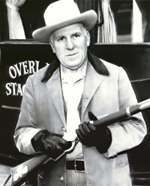 Preston Foster died in 1970. Tony Young died in 2002 of lung cancer. TV Guide’s Gunslinger Page, with TV Listings, Photos, Videos, Exclusive News and More. Set in Denver in the 1870s, the show worked off of actual cases from the old files of the Denver Police Department. Detective Tom Smith brought “modern” methods of criminology to the West. But the show was plagued by troubles. Intended for the 1959 -1960 season, it was delayed when singer turned actor Guy Mitchell suffered a should injury and then when Sam Buffington died. Audie Murphy died in in 1971 in a plane crash. Guy Mitchell died in 1999. Audie Murphy was an authentic war hero, the most decorated man in WWII.Guy Mitchell recorded “Singing the Blues,” the Number 2 song of 1956. 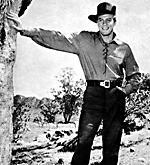 Filmed on location, this story, starring the elegant Peter Graves, was about an American building the first stagecoach line in Australia in the 1850s. 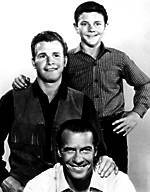 Some similarities can be drawn to Wagon Train, although this Western was also part circus show. The T&T Circus (for Thompson and Travis) traveled from town to town in a wagon train. And they had an advance man (think scout) in Gentry who found good places for the circus to stop. The stories involved both the circus performers and the Westerners they ran across. TV Guide’s Frontier Circus Page, with TV Listings, Photos, Videos, Exclusive News and More. This was as modern as westerns got. The ranch foman Jim Redigo had a masters degree in business and the “empire” included not just the ranch but oil, agriculture, and mining as well. The second season saw a name change to Regigo and an all male cast but the ratings killed it anyway. Richard Egan died in 1987 of prostate cancer. Anne Seymour died in 1988, she was 79. 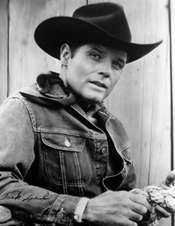 Before he knew to say, “Book ’em, Dano” Jack Lord played a rodeo rider who wanted to win the big prize – The Golden Buckle. Sadly, as the show only lasted one season, he never got the win. I hate it when that happens. Jack Lord died in 1998 of congestive heart failure. Warren Oates died in 1982 of a heart attack. TV Guide’s Stoney Burke Page, with TV Listings, Photos, Videos, Exclusive News and More. Temple Houston, son of the legendary Sam Houston, traveled the circuit courts in the Southwest in the 1880s. Elegantly tailored, he cut a fine figure as he employed his famous oratorical skills in court. Naturally, he was pretty handy with a gun too. Also followingthe circuit court was George Taggart, a U.S. Marshal and somewhat past his prime gunfighter. The real life Temple Houston was a contemporary of both Billy the Kid and Bat Masterson and according to legend, engaged in gunfights with both of them. Jeffrey Hunter died in 1969 of a head trauma. Frank Ferguson died in 1978 of cancer, as did Mary Wickes in 1995. Chubby Johnson died in 1974. U.S. Marshal Frank Raglan and his three deputies maintain law and order across the Black Hills and Badlands of the Dakota Territory. All three deputies had different personalities. Del Stark was explosive; Vance Porter was a bear; J.D. 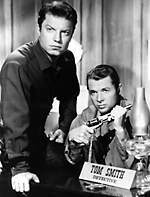 Smith was a gunfighter. But c’mon folks. 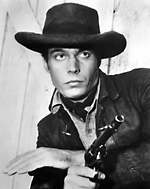 Chad Everett as a cowboy? Dr. Joe Gannon on Medical Center was better casting. Larry Ward died in 1985.